I grew up with blintzes. I have always loved the funny little things. My grandmother, originally from Chicago, made huge batches of them for our family dinners when we visited. She learned how to make blintzes from my great grandmother. She also passed down family recipes for borscht and all kinds of other Russian/Ukrainian classics. From them, my mother learned the art of blintzes. She, too, often made them for special occasions. It was a common request for birthday dinners among my brothers and I. Some of my earliest kitchen memories are of my grandmother and mother at the stove cooking up tall stacks of blintz pancakes in a special crepe pan. I remember being just a bit taller than the kitchen counter, looking at eye-level into a big bowl of cottage cheese and mashed crackers. I’d watch the blintzes being filled, rolled, fried in vegetable shortening, piled up on plates, and put on the dining table with bowls of sour cream and jars of cherry preserves. 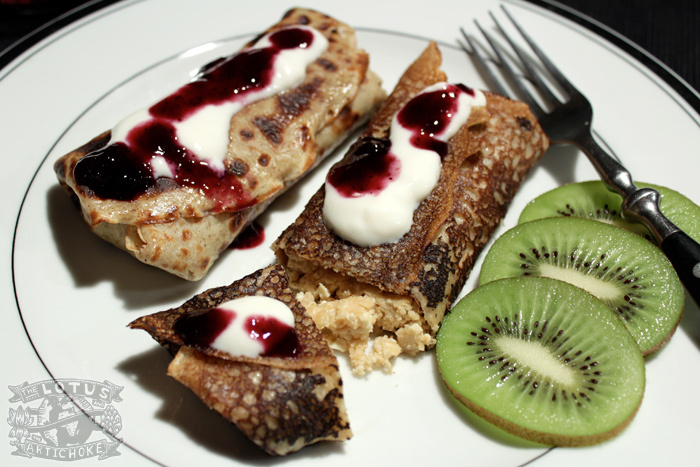 When kids at school asked me what my favorite food was, I’d usually tell them: BLINTZES! All too often I had to explain what they were. That seemed pretty weird to me. Didn’t everyone’s mother and grandmother know how to make awesome cheese-stuffed crepes?